Elizabeth Bowes-Lyon (1900 - 2002) was the Queen consort of King George VI from 1936 to 1952, after which she was known as Queen Elizabeth the Queen Mother. She was born into a family of Scottish nobility on August 4, 1900 at a location that remains uncertain. She may have been born in her parent's Westminster home or in a horse-drawn ambulance on the way to a hospital. In June 1939, Elizabeth and her husband toured North America. 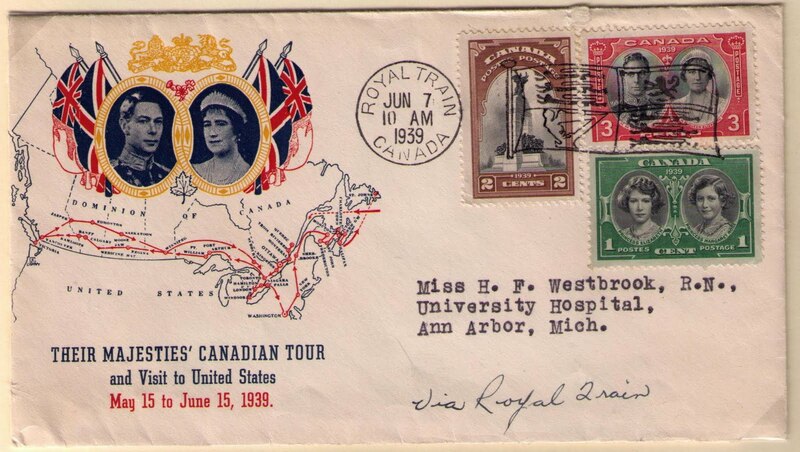 The tour was designed to bolster trans-Atlantic support in the event of war. Their reception by the Canadian and U.S. public was extremely enthusiastic. I am told of a story about my mother during her visit to Canada in 1939. My father and mother were scheduled to visit a veterans' hospital in the province of Quebec during their six week tour. Two Boer War veterans, both of Scots heritage, argued for weeks before my parents' arrival. One said "She was born in Scotland, so I say she's Scots". The other said "She married an English man, so I say she's English". They decided to let Queen Elizabeth settle their cultural differences. When the two were presented to Her Majesty, they asked "Are you Scots, or are you English?" My mother paused, and then replied "Since I have landed in Quebec, I think we can say that I am a Canadian". 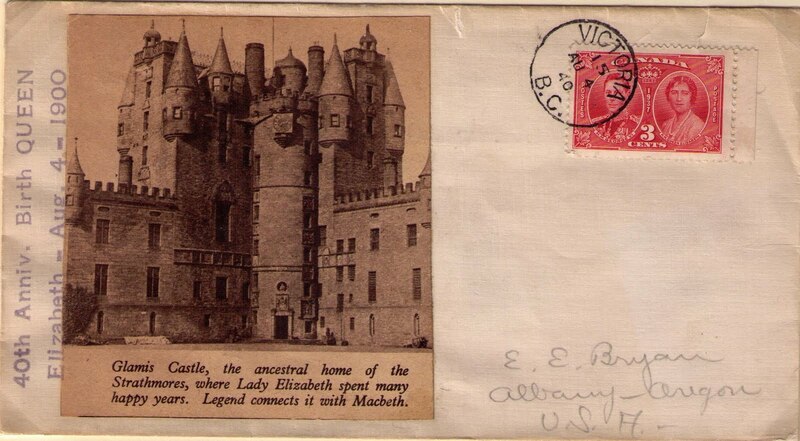 The cover shown below commemorating Queen Elizabeth's 40th birthday was cancelled at Victoria on August 4, 1940. 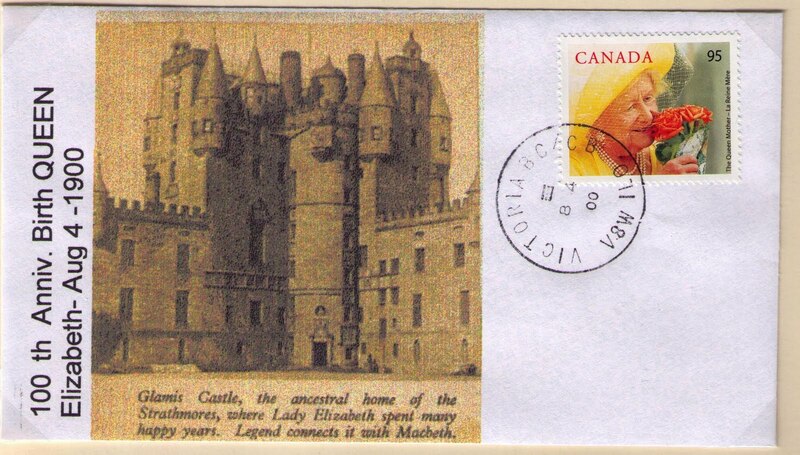 On May 23, 2000, Canada Post issued a 95 cent stamp to celebrate the 100th birthday of the Queen Mother. The author prepared souvenir covers similar in design to the envelope prepared in 1940, and requested that the Victoria postmaster postmark the souvenirs on August 4, 2000, the Queen Mother's birthday. The postmaster kindly obliged and the covers were returned under separate cover.